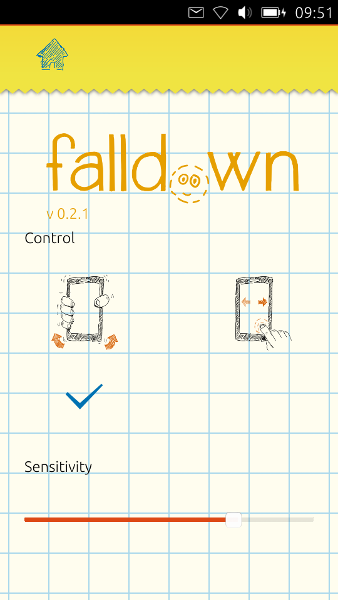 a week after the first release of Falldown I’m here to announce you a new update for the game with some interesting new features! But first of all, thanks to you all for downloading the app (350 users have downloaded it so far) and for all positive feedbacks we received, both on store and on the Internet. Now there are two different ways to control the ball: with tilt, as usual, and with touch, so you can play also while you’re moving, like on bus. Thanks to community translators we added Asturian, Galician, and Hungarian translations. Also thanks to all the translators that are keeping translations updated. You rock! We have great plans for the future. Other than continuing to support and improve the application, fixing bugs and adding some minor feature (like animations between different screen) we’re planning to insert two new big features, so we’re already working on version 0.3 (but expect some minor updates in the 0.2 branch before). 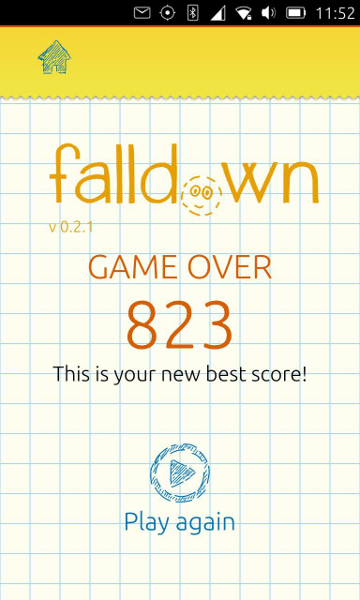 Oh, btw, do you know we spend a lot of time playing Falldown? I’m not very good at it (my record is still 625) but Tyrel set the new record for the team, 823!